Tour departs from most Punta Cana hotels. Gather your comfortable walking shoes, sun hat, and sunscreen and be ready for pickup at your Punta Cana hotel around 7am. Settle in to your seat on a comfortable tour vehicle for the ride through the eastern Dominican Republic's fields of sugar cane to Three Eyes National Park. Explore the lagoons and underground caves once used by the native Taino Indians, then head for the Columbus Lighthouse, where you can see Columbus' tomb. 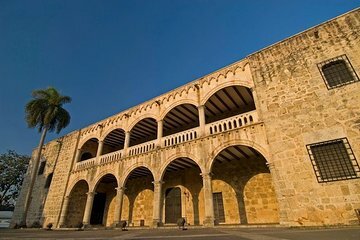 Continue on to Santo Domingo's Colonial Zone, the epicenter of the city's history and culture. Disembark for a walking tour of the area, beginning at Columbus Palace and continuing on to highlights such as the Plaza de Espana, the Calle Las Damas, and the first cathedral of the New World. Stop for a buffet lunch of Dominican homestyle cooking, accompanied by dance performances by the waitstaff. Once you've eaten your fill, visit some of the modern areas of the capital, including the National Palace where the government is centered. End the day with some free time for exploring on your own or shopping for souvenirs.